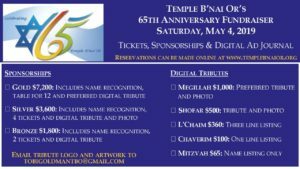 Ad Journal for 65th Anniversary Would you like to be part of our digital photo album commemorating Temple B’nai Or’s 65th Anniversary? You can! Click here to be part of our history! Questions? Email Tobi Goldman.